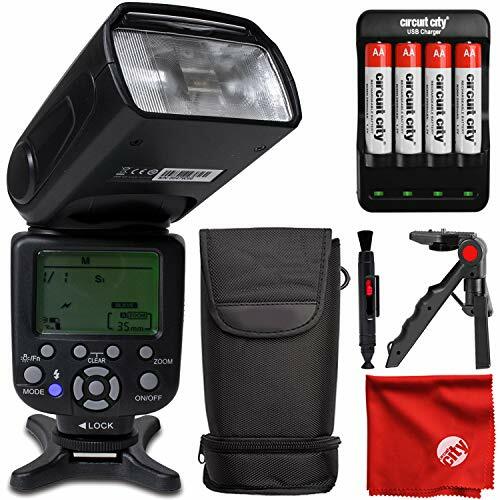 The DM680EX has an auto-focus assist for low-light photography, and an automatic power-saving function that turns the flash off when it's inactive. It is powered by four AA batteries (not included), with a flash duration between 1/800 and 1/20,000 of a second. A convenient HV port allows you to connect the flash to an external power source for extended usage and faster recycling. The included stand allows you to set the flash up on a flat surface or to attach it to a tripod head, light stand, or clamp that has a standard 1/4″-20 mount. DEDICATED - The Digitalmate DM680N dedicated flash is a flash unit that fits into your camera's hot shoe. The dedicated flash is a great piece of gear that communicates with the camera. A dedicated flash is a far better tool than the built-in flash because of the versatility it gives you.